You have excellent timing. My 18 month old son has cystic fibrosis, and mostly I don't think about it much, but every once in a while, I give in to despair about his future. Yesterday was one of those days. I'll try to remember this. And that God is working on my spirit, too. What a lovely reflection. I have a child with cerebral palsy, it hits home. Thank you for the encouragement, we have a son (21) who has Down Syndrome, and as I hard as it is sometimes, he is a blessing to us and to others and we love him. Oh Betty...what a beautiful post and as we have shared these things in the past few years I am reminded of what love you have for your son. How well put; out body is only temporary. We've often talked about finding joy in the moment....and what an applicable verse...God loves to have us joyous. I like HIS sense of direction and purpose in our lives...only He knows what can give us the greatest joy. And I believe joy is only realized when placed against such a palette as this....surely He knows this and the words of James 1:2 underlines the significance of it. Luv ya Betty dear. When I saw the picture you choose for your post i brought a smile, knowing that those little puffs must bring your son delight. Thank you for opening a tender spot in your heart, Betty! 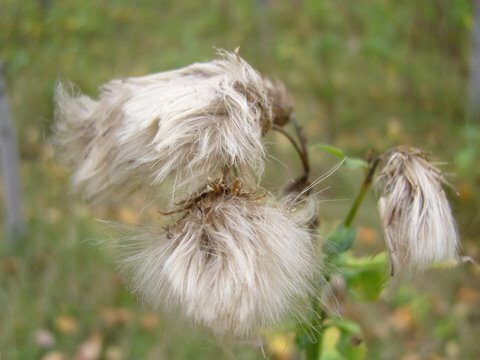 Your experience is like a thistle puff... blow it from your heart and others will be touched. Thank you for posting from your heart today Betty. I just want to reach out and hug you and tell you how much I admire you and how I rejoice with you that God is able! What a wonderful honest posting.. I do have a niece who was born with Down Syndromer.I know excatly what you feel. In the Middle East a handicaped person is a shame to his family. It's hard to accept this fact in that part of the world. Thank God for his Mercy and Blessing, my brother has surrounded Myriam with all the love, and respect. He calls her his...Myriam is now 13 years old and faithful chirstian and part of a youth bible study, doing great a her school and she wants to be a teacher . Betty, although I have never met you, I have seen the very special love you have for your son. You have blessed me. I'm sure that many times you have asked God why He would choose you . . . one day, we will understand that our life here on earth really is just like a puff, blown away by the wind ... then we will know fully, just as we are fully known by Him now. All I know now is that God loves him and has chosen a wonderful Mom and Dad for him. What a testimony...to God's faithfulness despite the hardships of life. Thanks so much for sharing from your heart today, Betty. You have inspired me on many occasions...your confidence in God's strength is never failing. What a great word picture...to see your son with a temporary body and a soul that is whole! I won't forget that. My name is Maria and I have a little girl, 11 yrs old, that is autistic. She also does not speak or walk for that matter. Yet this verse is the only verse, I have not been able to completely accept. Especially these days, when my daughter suffers so much. But stopping by your blog, sent over by another friend, you have blessed me beyond belief! Yes, she has a soul that is whole...but her body is only temporary...Yes, I know that the Lord has blessed us with our little girl because it was His will to do so. I have learned so much through my daughter...but mostly, I have learned to love her just the way she is and to enjoy every single moment that she is content and be at peace when she is not. He is in complete control! I love the Book of James for its simplicity and logic. I turn to it when I feel overwhelmed or lost. It's a short book, making it easy to read the whole thing in one sitting, and its straight-forwardness calms me. Betty, you have inspired me so often with the unconditional love you display for your son, for your enjoyment of him and the good you see in him. I have often thought that what we see as trials, God sees as blessings. May God grant everyone of us the ability to see His image in these special children. I love true life stories. This is moving Betty and it's amazing to see how you God has given you so much sensitivity around your Jon...Many of us have a wide variety of challenges..Thank-you for sharing these moments with us. Some 45 years ago I remember my younger sister making cream puffs in our family kitchen. As an older sibling I laughed at the 'popcorn' that she had made and watched them all disappear in a few minutes. I know that I am very late in popping by, but can't help but leave you a comment none the less. and thank you for sharing you heart with us. Hey Betty: Good thoughts. It's been quite a journey, hasn't it? BettyR, this is a powerful and moving post. My eyes are filled with tears, my heart filled with love. God bless you and your family. Awe! What a great blog, and a great qoute! I love Jonothan and my life wouldn't be complete without him. He brings a whole nother' meaning to unique, that is for sure! I love him and this blog!